Many people are familiar with maple syrup and know that it is made from the sap of maple trees. The process used to make real maple syrup is complex and not a simple DIY project. Another option is to produce hickory bark syrup using the bark from Shangbark hickory trees. Making hickory bark syrup is a two-stage process. The first thing you need to do is obtain the right type of bark. The eastern United States is where a lot of Shangbark hickory trees are found. These trees have a shaggy appearance as the bark exfoliates. You can collect bark for your hickory bark syrup just by looking on the ground. Bark can also be harvested from a tree if there are no pieces on the ground. The best thing to do is look for pieces that seem loose and appear ready to fall. You don’t want to remove the fresh bark from the tree as that will harm the tree. Fortunately, hickory bark syrup only requires a few pieces of bark and that is easily collected from fallen or loose bark. 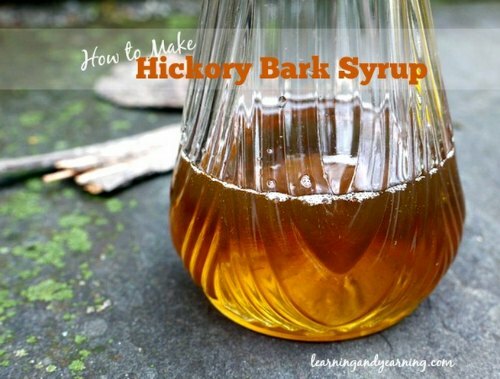 The first thing you need to do when preparing hickory bark syrup is to clean the bark. You need to clean both sides of the bark to remove all dirt and debris. The next step is to heat the pieces of bark by using your oven. The bark needs to be lightly toasted to bring out the hickory aroma. Boiling the hickory bark in fresh water will produce a hickory-flavored tea. Making this tea is the first step in making hickory bark syrup. However, once you start to smell the delicious flavors, you may want to just add honey and simply enjoy an amazing cup of tea or you can finish the overall process and create a tasty syrup to use for breakfast.